Sydney Australia – A city of 4 million souls who live in an espresso crazy society. For Craig Hiron, a youthful 36 year old living in one of Australia’s most populated cities, bright ideas are merely a cup of coffee away. And so it was – that he and his circle of free-spirited 30-something friends would gather (like so many other young people around the globe) looking for the answer to life’s age old problems and questions. Photo above: The Otto Espresso maker is the product of passion, Australian ingenuity and the burning desire for award winning fine design. Sydney is noted for its spectacular Opera House, the Harbour Bridge, and its beaches. The metropolitan area is surrounded by national parks, and contains many bays and inlets. But on the street level, Espresso coffee is the language of its people. Australia, in general, is quickly becoming an espresso-centric society – and that means, Espresso coffee is the building block of all its coffee beverages. Neato. For me, that means heaven! Good thing – Craig was good and ready to put his money where his coffee cup was… but what came of this exercise? The idea hit Craig like a sack of unroasted Arabica coffee. Take one 50 year old coffee maker. Update that coffee maker. Sydney society needs a coffee maker to put Australia on the map and into the coffee culture history books for all time. It just made sense. But what of the name Otto? True story. The name of this new coffee maker comes from the 1st born Son from within Craig’s creative and bright circle of friends. Additionally, all the research and development is taking place within the community of Sydney, Australia – all paid for by Craig and a handful of his friends. Craig and I spoke over a trans-pacific phone line for over a half-hour. His infectious laugh and sense of humor did little to hide his burning passion for all things caffeine. We will be hearing more from this story – as it happens. That machine is a thing of beauty — worthy of design museum status. Would love to see it in action!! 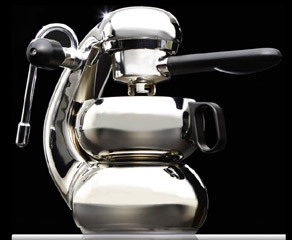 We once had one of these Otto Espresso makers and gave it away as a gift. We would love to purchase another. Can we order one from you? It’s not a new design, it’s a blatant rip-off of the Atomic coffee machine. Let me guess – the Chevrolet was a blatant rip off of the Ford… and the original Gaggia machine? All machines after that were rip-off`s too? I think you need to look a little close at the old atomic and this new one – there are some differences… perhaps some improvements. Time will tell. 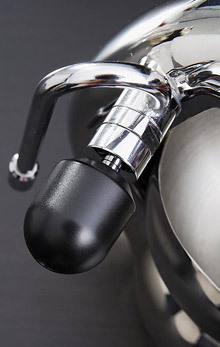 I’ve just purchased an Otto and I must say that I love it!! – it works a treat.